Foodspiration: Foodstorm: What Should We Do with Pumpkin Cream Cheese? Foodstorm: What Should We Do with Pumpkin Cream Cheese? 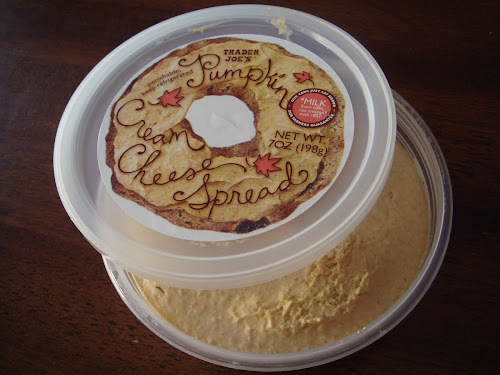 I couldn't resist buying this new and seasonal item, pumpkin cream cheese spread. Aside from putting it on a bagel, what else should I do with it? Any ideas? Let's have a food brainstorm! What if you spread it on a flat-bread/lavash type bread, sprinkled nuts on top, rolled it up and sliced it into pinwheels? A sweet little snack. I was given a container and have to admit I loved the idea of Pumpkin Cream Cheese but after tasting it I didn't really like the flavor so I am interested to see what suggestions you get because I think combined with the right flavor/texture it could be good. Hmm, I did like the flavor but I do have to point out that it is cream cheese "spread" and you can tell that it isn't exactly typical cream cheese consistency. It seems more aerated and I like the lighter, whipped texture. I almost want to put it in a piping bag and make a pumpkin-spice muffin and then pipe this on top. I also wonder if a version of a pumpkin-carrot cake could be good. so far, i've been putting on a toasted bagel thin- pretty boring but tasty for breakfast. Hi Lauren - spread it on some ginger snaps. Its great! Ooh you could make a sandwich cookie with two gingersnaps and the cream cheese spread in the middle!